It’s often difficult for patients to tell who’s who in hospital or to tell the difference between a young -looking house physician and a mature medical student. When I started on the wards as a clinical medical student, I had already qualified as a dental surgeon and had a bit more gravitas than my friends. I always introduced myself quickly as being a student. This excerpt from my memoir ‘Woman in a White Coat’ describes my first day on the wards. We stood outside the Bristow female medical ward, stethoscopes hanging nonchalantly out of our pockets, about to start our clinical attachments to the medical, surgical and obstetric firms. Through the leaded windows in the double doors, we could see Sister’s desk, and the nurses in their blue and white striped dresses busying themselves about the patients. We hesitated, uncertain whether to go in or wait for our senior registrar. Dr Evans, a tall red-haired man, strode up. He handed each of us a buff-coloured folder. My patient was Mrs Mary Roberts. A nurse led me to a side room and deposited me by the bedside of the most enormous woman I had ever seen. ‘Our Mary’s quite a character. You may need some help when you come to examine her,’ she told me. I pulled up a chair, sat down by her bed, and looked through the thick sheaf of notes. She’d been in and out of hospital many times. The first two fingers of Mary’s podgy right hand were stained brown. She coughed wetly, and spat into the sputum cup by her bed. I wrote out a summary of Mary’s long medical history, and drew the curtains ready to examine her. The male students had to get a nurse to chaperone them if their patient was in a side room. Being a woman, that didn’t apply to me. With a lot of struggling on my part, and heavy breathing on hers, I managed to wrestle her nightdress off. I stared with horror at her enormous breasts. The apex of the heart is under the left breast, but each breast looked as if it weighed several pounds. How on earth would I get a stethoscope underneath? When we were shown how to listen to the heart, we’d had a slim, elderly man to practise on. I hurried out, but all the nurses looked busy. Finally, I saw a nurse with a red belt, a staff nurse. I told Mary to cover herself, and meanwhile looked at her swollen hands and feet. When I pressed the flesh of her ankles, my fingers left a dent which didn’t fill again for some time. She was having trouble catching her breath and her neck veins were engorged. ‘Superficial examination suggests the diagnosis of right-sided heart failure,’ I wrote. A junior nurse bustled in, her starched apron crackling against her dress. She tried not to grin as she lifted a huge left breast with both hands, while I struggled to get the bell of my stethoscope underneath. The skin was red and sore from being constantly warm and damp. There was a strong smell of caked talcum powder. By the time I’d completed my examination of Mary’s cardiovascular, respiratory and nervous systems, I was exhausted. The notes said she weighed seventeen stone, but it felt as if she weighed a ton. Tubby Isaacs Jellied Eel stall stood at the corner of Goulston Street and Aldgate. The red-faced, cheerful stallholder in his signature straw boater, white coat and black bow tie, used to call after me on my way home from St Margaret’s. ‘Lovely jellied eels, miss. Cockles and mussels, Alive Oh,’ he’d shout, knowing I would make a face. Eels and shellfish are forbidden to Jews. I felt sick at the thought of those grey slices of eel on his stall. I couldn’t imagine anyone wanting to eat the disgusting things, even if they weren’t Jewish. Over the next few weeks, I watched Mary’s vast bulk shrink, as the digoxin and diuretic pills began to work. One day, as I was checking her over, she started to cry. On my way home from Aldgate East station that night, I went up to Tubby Isaacs stall. I cringed at the sight of those mounds of cockles and whelks and other seafood I didn’t want to identify. To one side there was an enamel bowl full of clear jelly containing slices of jellied eel. ‘I’ll have a tub of jellied eels,’ I said, breathing through my mouth. I hid the tub behind my books, away from my mother’s prying eyes, and thought about Mary in a geriatric ward. If she was lucky, it would be clean and cheerful, like the one at St Margaret’s, but that was only for short-term admissions. I’d visited a miserable urine-smelling long-stay ward, when my great aunt had her stroke. It was ghastly. When I arrived next morning, Mary was dressed and waiting for the ambulance to take her to St Mildred’s. Her eyes were red and swollen. She clutched my hand. ‘This should cheer you up a bit,’ I said, and handed her the tub from Tubby Isaacs. Jellied Eels, Established 1919. A smile lit up her face. It happens every time as I try to leave the country. As I go through security I set off the alarm. 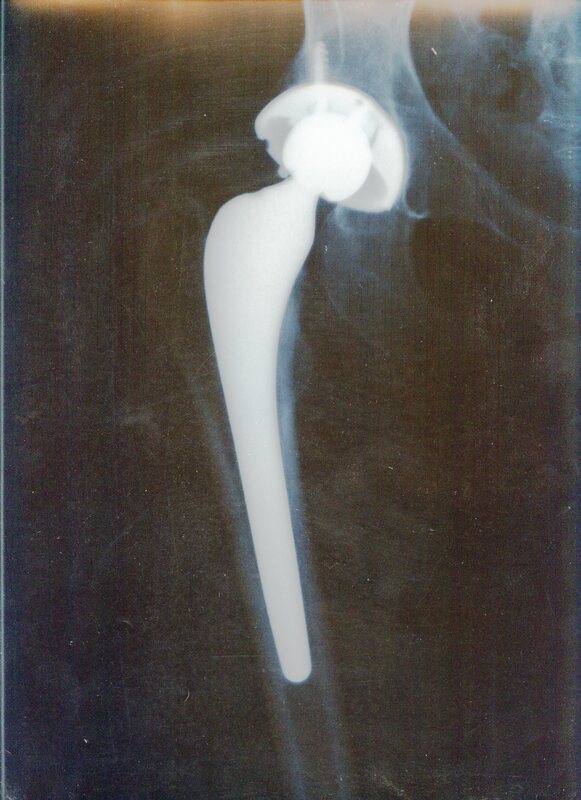 It’s that enormous piece of metal in my right femur that does it. Then I have to be patted down by a grim-faced female security guard. I suppose they’re not allowed to smile at a suspected terrorist, though they are helpful and all smiles once I’ve been frisked. I’ve thought of taking a doctor’s letter or my X-ray but I suppose they’d be discounted, since I couldn’t prove they related to me. My daughter Louise was expecting her second baby any day, so I had flown to Spain to help look after her family. Instead I spent 10 days in Hopital San Dios on the hillside above San Sebastian. I had to get special permission from the surgeon to slip out and see my new grandson. It was vanity, sheer vanity. I’d missed out on Doc Marten’s when they were all the rage and when I saw the thick-soled boots in the Ecco shop I couldn’t resist them. I should have given them to Oxfam after I tripped hurrying to get to the Post Office before it closed. That time I’d only skinned the palms of my hands and torn a hole in my jeans. When I tripped crossing the road in San Sebastian, I broke my hip. I had a total replacement under an epidural anaesthetic. There was no nonsense about being woken at six in the morning as I would have been in an English hospital. Food seemed to arrive every couple of hours. It started with coffee and croissants at 8am; then mid-morning coffee and biscuits, a delicious three course lunch, a mid-afternoon snack, an equally delicious three course dinner and, of course, a snack before bedtime. The nurses worried that I didn’t eat enough but I just couldn’t eat it all. I worried I’d never be able to lose the weight I must have put on. I was worried that the bone had fractured though a site of secondary spread from my breast cancer of 10 years before but it was osteoporosis and Anno Domini.